Roy Cooper is a four-term attorney general in NC currently running as the democratic candidate for governor against incumbent Governor Pat McCrory. With the election less than three weeks away, the national spotlight is on North Carolina as a key swing state in this election. The latest polls in the governor’s race show incumbent Governor Pat McCrory head-to-head with democratic challenger Attorney General Roy Cooper. Cooper has outraised McCrory by millions and outspent him in television ads. The candidates met multiple times for face-to-face debates during which they sparred over House Bill 2, taxes, and environmental issues.Cooper’s tenure as attorney general has been marked by some controversial moments, including his decision not to defend House Bill 2 and ongoing concerns about problems in the State Crime Lab. 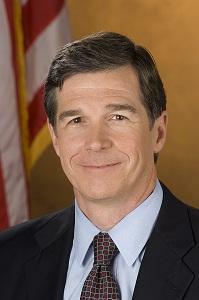 A conversation with Attorney General Roy Cooper. Host Frank Stasio talks with Attorney General Roy Cooper about his work in public service, his platform and his priorities for the state. We have invited incumbent Governor Pat McCrory to appear on the program, and the request is pending. In North Carolina, liberal groups have outspent conservatives on television, and Roy Cooper has outraised Pat McCrory, according to the most recent campaign finance reports available. Cooper had raised 47 percent more money from 76 percent more contributions than McCrory through June 30, the most recent date for which campaign finance information is available.